A World Cup win can transform a nation. It can send a nation's cricket graph on an upward swing, that can last for generations to come. The players sweat it out for four years and hope to make a lasting impression by performing at the world's third most-watched quadrennial event. Mahendra Singh Dhoni's Team India ended the cricket-crazy country's World Cup drought, that lasted 28 years, in 2011. The Men in Blue beat Sri Lanka in the tournament finale at the Wankhede stadium in Mumbai and became the first host country to win ICC's marquee event on 2nd April 2011. Subsequently, by beating co-hosts New Zealand in the final on 29th March 2015, Australia became the world champions for the fifth time, but only for the first time at home. Now let's have a look at the top five batsmen, who dominated ODI cricket before the elusive trophy changed hands from MS Dhoni to Michael Clarke. The former South Africa skipper is one batsman, who, on his day can easily rip apart the most potent bowling attack in the world. With a mind-boggling strike rate of 107.82, AB de Villiers scored 2936 runs in the 60 ODIs he played between the 2011 and 2015 World Cup. He scored eight centuries and 17 half-centuries during that time period. Although his career-best ODI score of 176 came in 2017 against Bangladesh, De Villiers's top score at that time was 149. 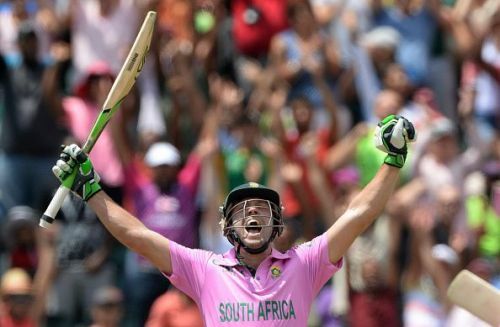 In a record-breaking 2015 ODI against the West Indies, De Villiers brought up the fastest ODI ton in just 31 balls. Scoring at a strike rate of 339, De Villiers came in to bat in the 39th over and scored 149 off just 44 deliveries, hitting nine boundaries and 16 maximums in the process.